You don’t need an ice pick or crampons to ascend Colorado’s most accessible "fourteener." 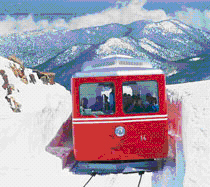 Just outside of Colorado Springs, an hour south of Denver, Pikes Peak towers 14, 110 feet above sea level and lures visitors to its summit year-round on the Pikes Peak Cog Railway. In operation since 1891, the narrated trip provides local history, mountain facts, and spectacular views. You’ll see streams tumbling over giant boulders, outcroppings of cliffs, and, if you keep your eyes open, Rocky Mountain bighorn sheep, marmots playing in the meadows, grazing elk and deer, and even an occasional bear. As the Cog slowly reaches for the clouds, you pass through dense Colorado blue spruce and Ponderosa pine forests. You draw closer to the delicate alpine tundra, covered in places with wildflowers and mosses. Finally, you break out above timberline and breathe in the clean crisp air and the faint fragrance of the pine forests below. It’s not unusual to encounter a snowstorm at the top — so make sure you pack a coat and hat. From the summit, on a clear day, you can see four states; the Continental Divide; and the cities of Colorado Springs, Manitou Springs, Cripple Creek, Victor, and Denver. While you’re up top, enjoy a high altitude donut and a cup of steaming coffee in the Summit House. You have about 30 minutes to snap pictures before you descend. Round trip takes approximately 2 hours and 30 minutes. Board the Cog Railway at the Manitou Springs Depot, Ruxton Avenue, Manitou Springs. Disabled access limited and reservations a must. Price: April – June and September – March, adults $29, children (3-11), $16; July and August, adults $31, children $16.50. For further information call 719-685-5401 or visit www.CogRailway.com. To buy this article for use in your publication, click here. Photo taken by Pikes Peak Cog Railway.